Thank goodness it is Friday! Although I have to get up a little early tomorrow to get some much needed pro bono hours (that my school requires for graduation...yikes! ), I am still looking forward to the weekend. I hope we can squeeze in some fun and rest. Our week was actually pretty special. I got some much needed extra time with the boys. 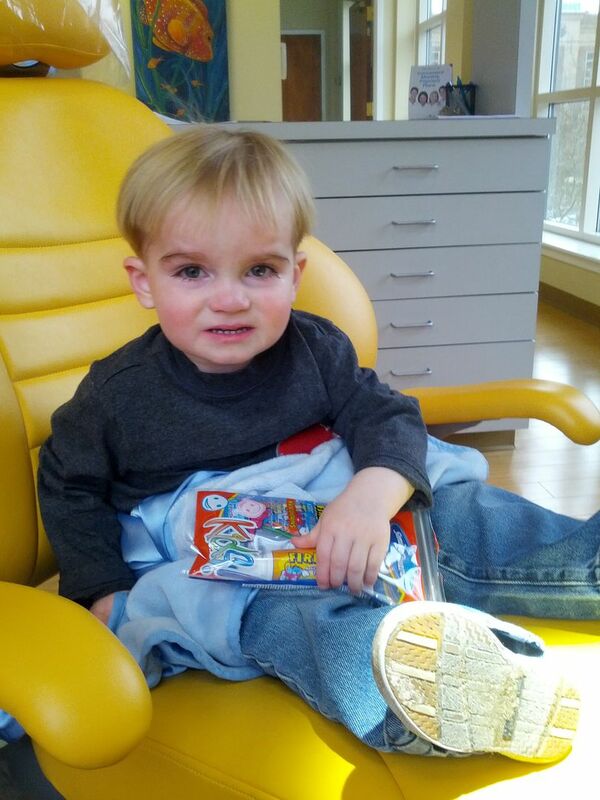 On Monday, Brody was still recovering from a little tummy bug. We were supposed to train our new nanny that day, but we decided to wait until Tuesday. Both boys actually had dentist appointments at the same time. 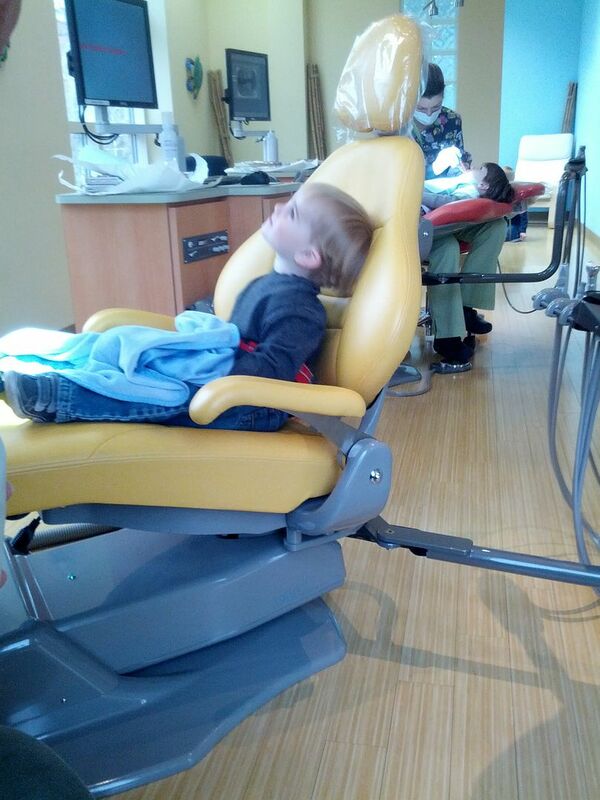 This was Brody's first time in the dentist chair. 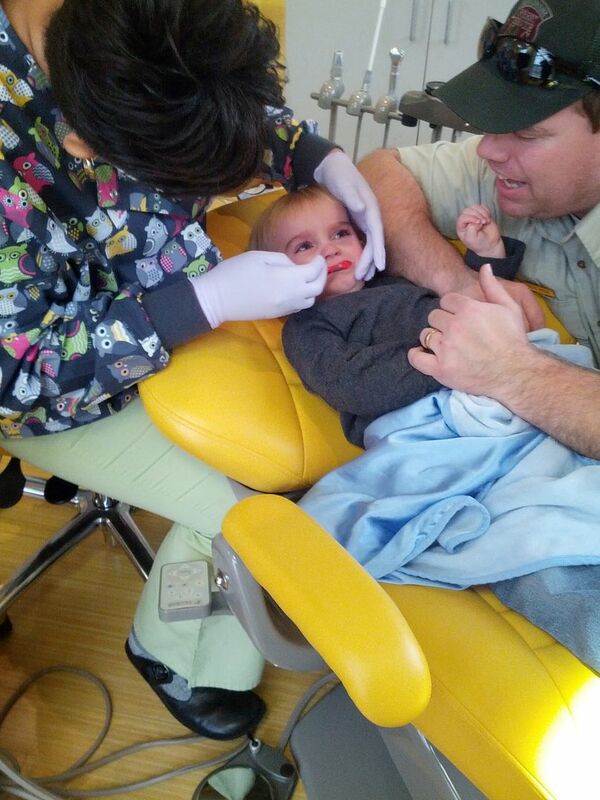 Pretty much at this appointment, they "count" his teeth and just try to make it a fun experience. He loved sitting in the chair with his big brother and watching a movie on the screen above them. He usually loves brushing his teeth and knows when it is time to do so at home and will get his toothbrush and toothpaste when he's ready. He was a little less enthusiastic about a stranger messing with his mouth, but he did let her brush them a little. He also learned to "show us your teeth" where he will bite his teeth together several times as he shows them to you. Another trick he showed us this week was washing or wiping his booty. When he is in the bathtub and you tell him to wash his booty, he'll take his cloth and just scrub away at that little toosh. Ha! After the dentist appointment, the boys and I enjoyed lunch at Chick-fil-a. I just loved my conversation with Evan during this time, and they both really were on their best behavior. Evan really helped me get everything for the table. He is such a big helper these days. 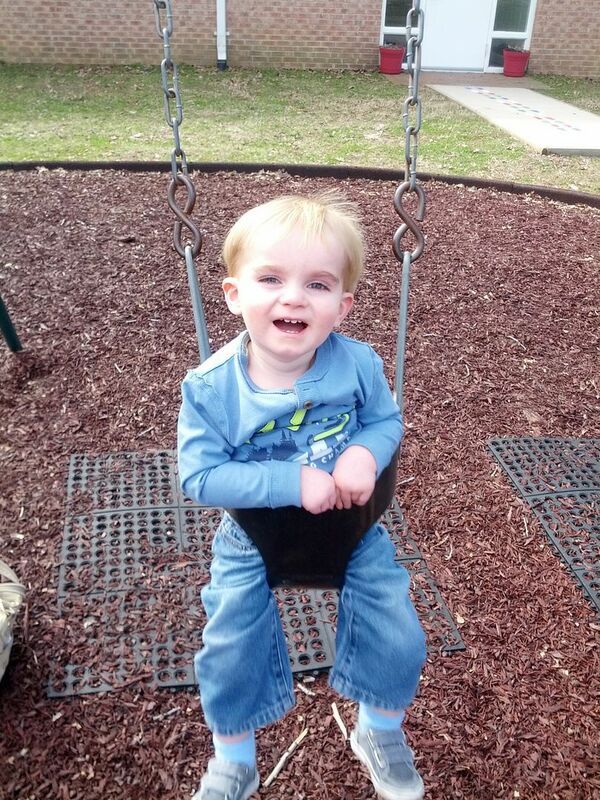 On Tuesday, Brody and Mommy enjoyed spending the day with our new nanny and her little man, Jonah. 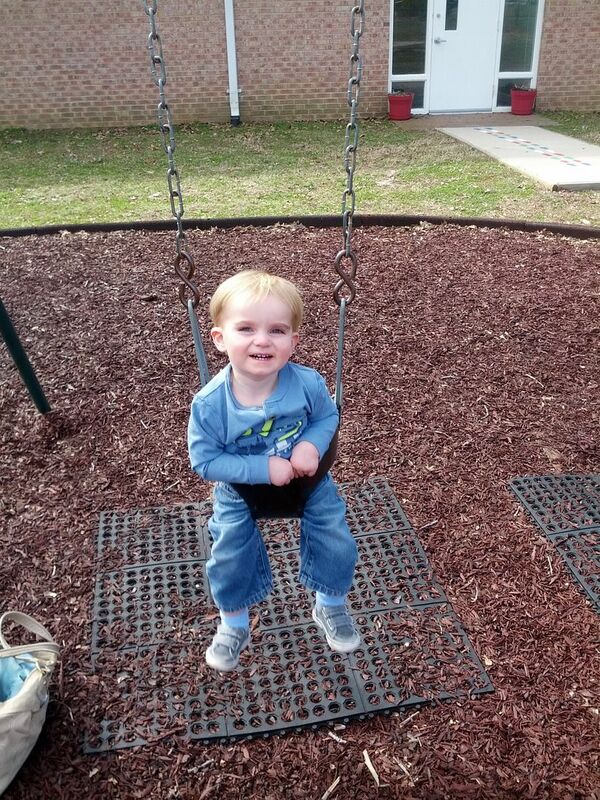 Brody will have a new playmate during the week as his nanny will bring her little two and a half year old with her. 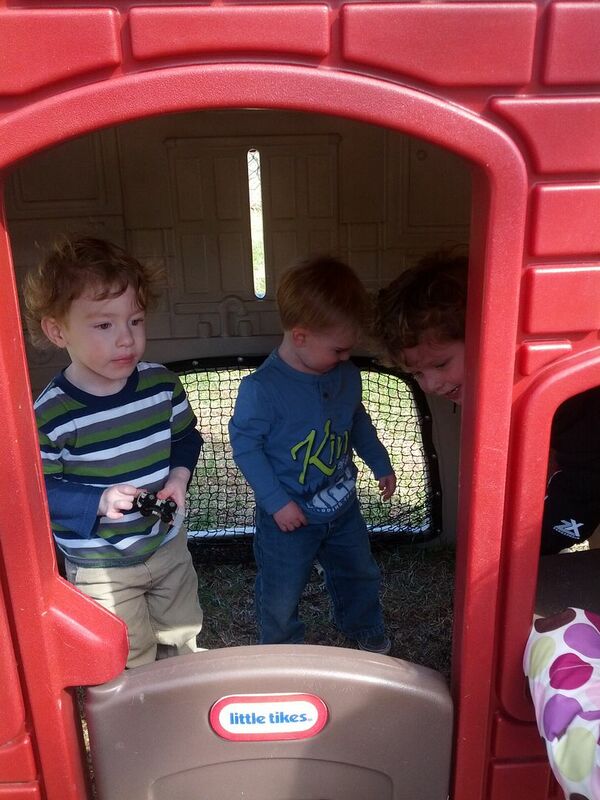 Brody and Jonah seemed to get along well although they both do like to make messes. 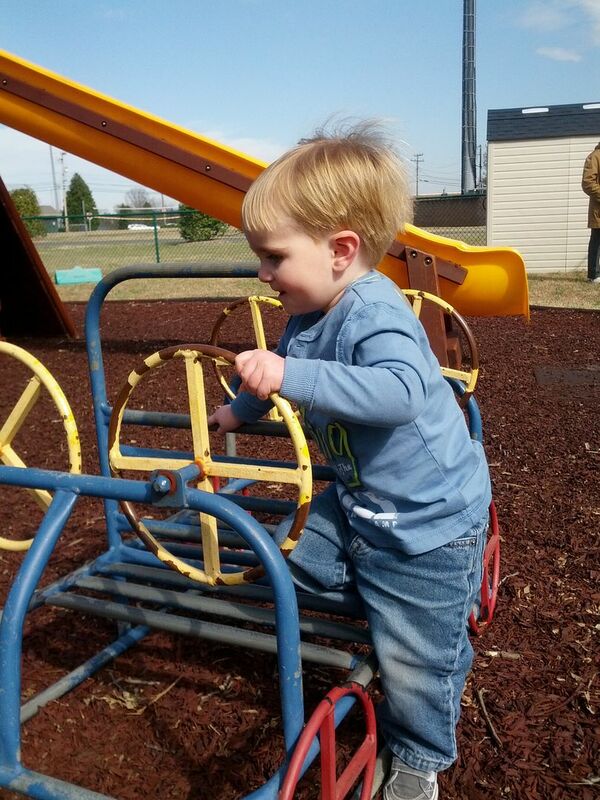 We took Jonah and his mom to see Brody's school so she could see how to pick him up so we took advantage of the playground for a little while. Then, the mommies went to lunch before picking Evan up. 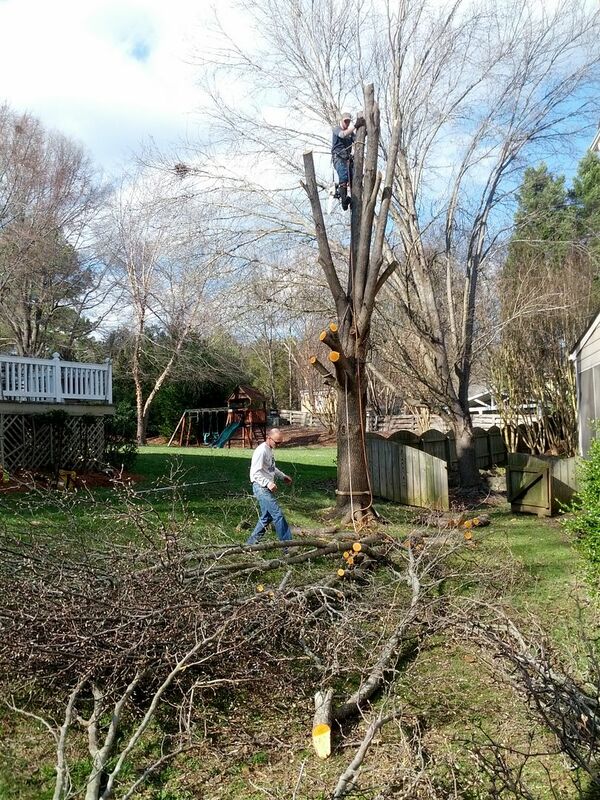 While we were doing all of these errands, an old Bradford Pear tree in our yard was being cut down. We got home with Evan just in time for him to "help" pull the tree down. He loved that, and one of the workers even gave him a $1 for his services. He said he was going to buy a new Skylander with it (which cost $15.00 to $20.00 a piece...ha!). Mommy was really spoiled by all of this extra time with her boys, and she can't wait until we can have more days like these. 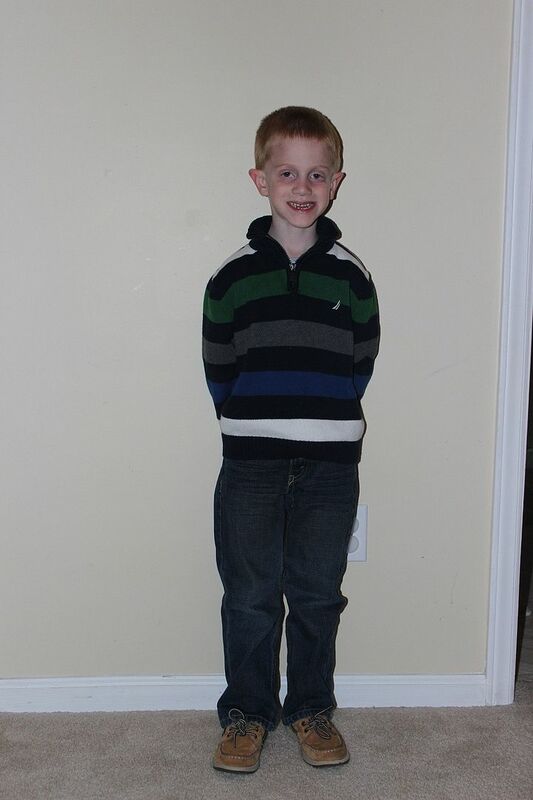 Evan looked so handsome for church on Sunday. Brody without his sweater vest after church on Sunday. 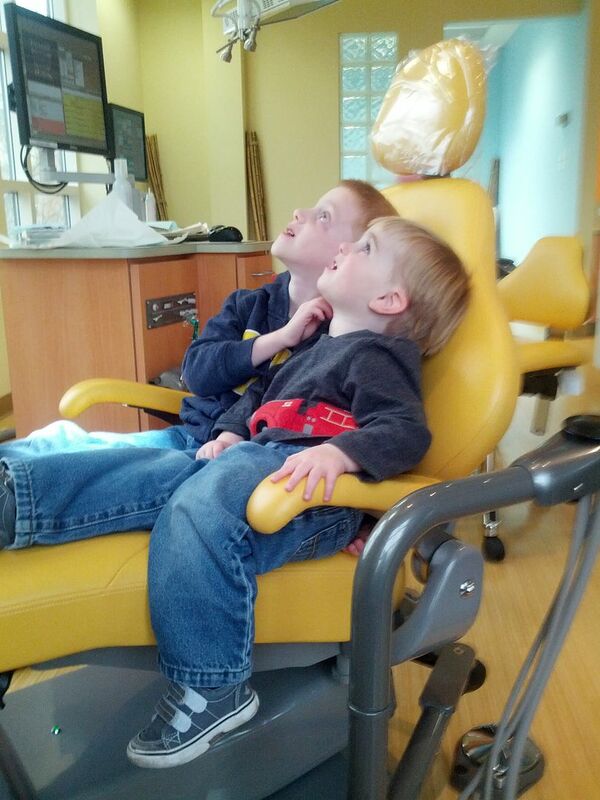 Evan and Brody share the dentist chair while watching a movie. 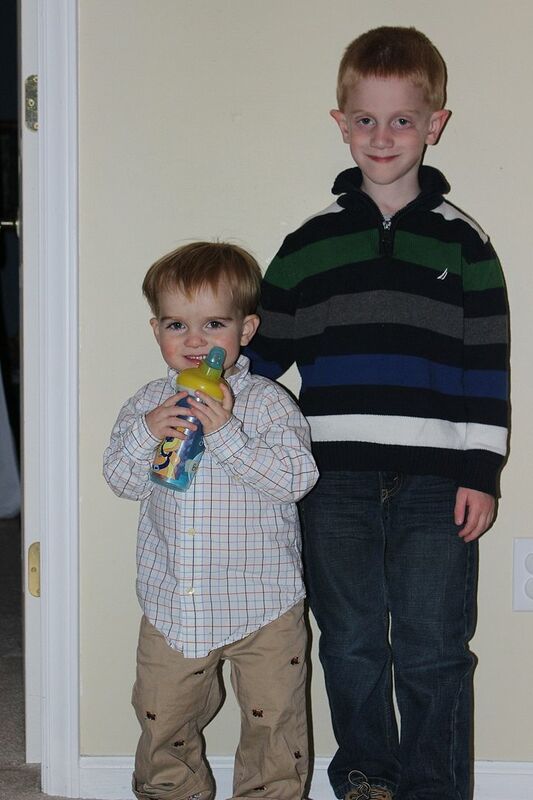 Evan went first to show little brother what to do. He's a pro now! Brody was fine as long as he could just watch the movie. But lying down and having a stranger stick something in his mouth was not his cup of tea. But he did well with only a few tears in his eyes and loved his little goody bag. 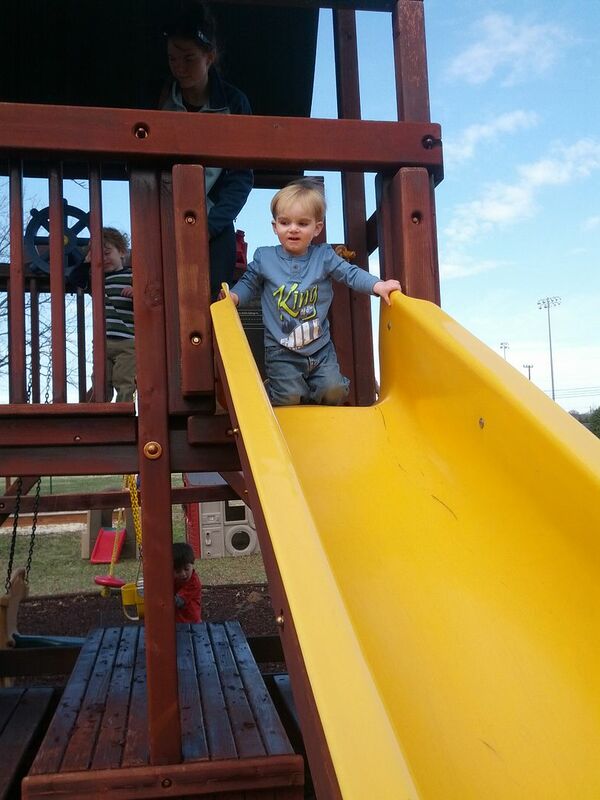 Brody and his new pal, Jonah, playing on the playground at his school. Going down the big slide. This one is a fast one so I caught him at the bottom. And of course, he had to drive the car. 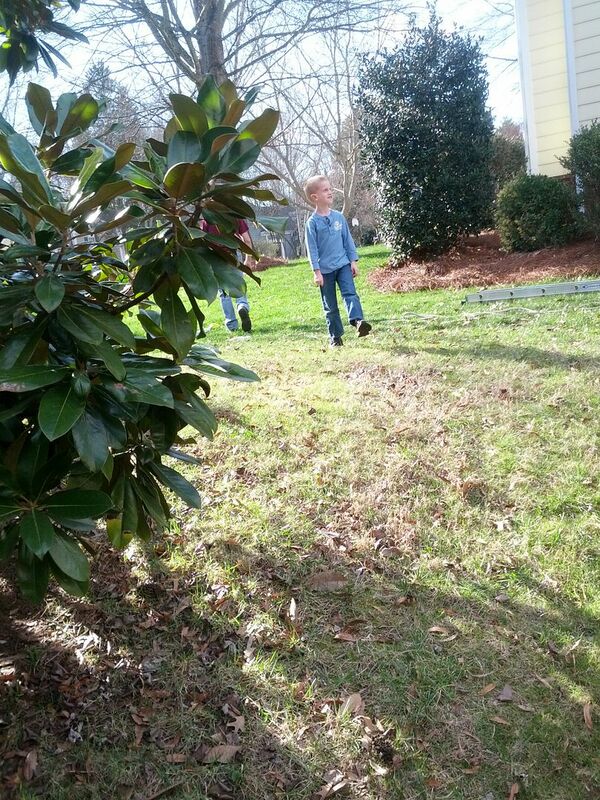 Evan was proud that he helped the big guys pull down some of the tree. Goodbye, Bradford Pear. I know our neighbors aren't sorry to see you go. Bradford pear trees are notorious for only lasting about 15 to 20 years before they get too big and their trunks start splitting and limbs start falling. Our neighborhood was once full of these trees, but homeowners have gradually been getting rid of them. This one had already lost one big limb that fell on our neighbor's deck several years ago. We have been watching a gap in the truck grow larger as the limbs separated so it was really kind of a hazard. 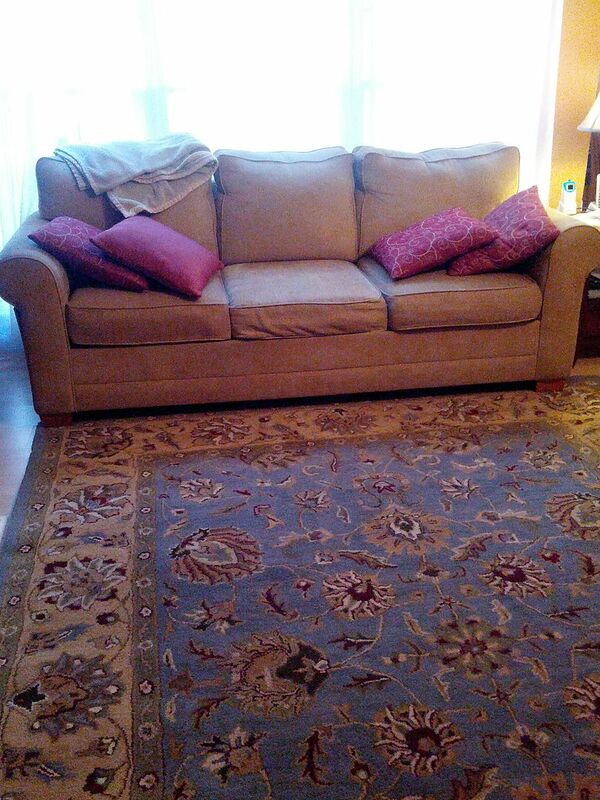 And my husband picked up our new living room rug today. We had been searching for a new one so that we could move our old one into the dining area because that floor is so cold, and I can't stand it. I wanted to move away from the old tones of burgundy and green so I wanted something with more blue that still felt warm and traditional to go with the rest of our furniture. I think this does the trick nicely, and it was in our very modest budget from our local Home Goods (a discount store that gets merchandise in from various places at different times so it is hit and miss whether you'll find what you want. We were patient and finally found this.). Love your new rug. It is definitely warm. It's blue, but not cool at all. I'm on a mission to find one for Spencer's room, but I think I'm going to go with a single color. I want durable, not beautiful if that makes sense. Yep, solids are great for kids' rooms. Target has some great options. I just have a little navy blue shaggy rug in Evan's room. Your boys dressed for church look so sharp! 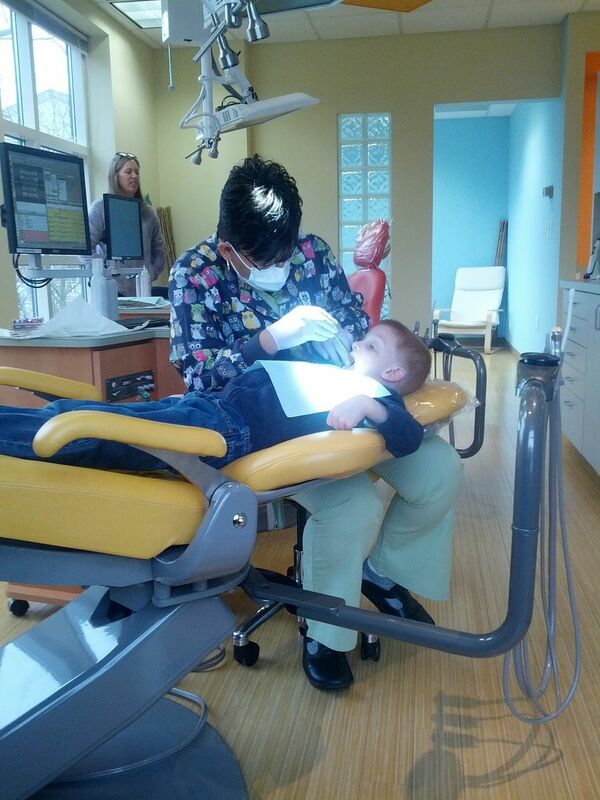 And I love the picture of both of them in the dentist's chair. Aww. Rachel has her first dentist appointment booked already (for December!) and I'm a little nervous about how it's going to go. And Sam loved it when they had to cut a tree down in the yard across from us in Edmonton. He watched the ENTIRE process (which took over an hour) and talked about it for weeks.